Yes, Most of my position I took during Japan Market session open till the end and Yes, I also took position during London market open.. I do understand that during Japan Market the payout is not attractive which is for EURUSD on AYREX is 78%, yet this is favorable time for me to trade.. I have traded this way on Binary options for quite awhile with other Binary option broker before I decided to open LIVE account with AYREX.COM without any problems such as LIQUIDITY or VOLATILIY that AYREX always mentioned.. I did not blame AYREX.COM on any mistakes that I did by my strategy. I am professional FOREX trader for years, it is common for me to win or lost.. I only complain to AYREX.COM since I feel that they are not honest on informing the new clients that they will have such constraints on taking the position.. If AYREX inform in advance that on LIVE ACCOUNT, the options available are limited and the value amount is only US$300 (NOT even near to US$3,000), then it is up to clients to still trade with AYREX or not.. Anyway.. True, it might be rubbish unless you try by yourself.. and PLEASE, inform me did you have the same experience or may be it is just only me.. For Ayrex Customer Support, I do understand that you should have your own way, so I wish you well. Once again I still do hope that your IT dept will improve so that more options are available at any value just like your DEMO ACCOUNT.. I am sure AYREX will have more HAPPY clients.. Just wishful thinking.. Thank you so much for your detailed answer! I will repeat myself by saying that we do provide $3000 and other traders confirm it, but it is still remain the truth. We are sorry that our platform does not meet your standarts and the moment, but we will do everything possible to make it as comfortable as it can be for our traders to work. Thank you for the very productive discussion by the way! Thank you as well Ayrex, I will try you guys and see if my $800+ trades will go through or not, hope I don't get disappointed and I solely trade during London and first half of U.S session....by the way, I need you guys to provide CAD currency account because this is what I want to trade on my account not U.S dollar please. Sounds like a very reasonable request, especially considering that we have already received the similar ones from our canadian clients. As you know, right now there are only 2 types of account on Ayrex: USD and EUR, as these two were the most requested ones (and they still are). However, as we would like to make your time on the platform as comfortable as possible, we will take this suggestion in work and see what and how soon it can be done within the current prerogatives. Anyone could deposit via Neteller card? I failed and the answer was different between Neteller and Ayrex! Great Arming.. I do wish that you try as well with Ayrex LIVE account and Please, Please Update me whether you have the same experience like I did OR You have smooth experience when placing position (Over US$300 or more) on Ayrex Platform during First Half of London market.. As my promise to you and Ayrex support.. I herby attach my LIVE trading statement when placing position with AYREX.COM during the opening of London market (Jakarta late afternoon, London morning).. Yes, during that time the pay out ratio for EURUSD is 85%, yet to me I can only place order at MAX US$300..
To Ayrex customer support, Please do understand that I really wish AYREX Platform could deliver the same performance between DEMO and LIVE account so that the serious traders like me could place the position at whenever, wherever and whatever value I want to execute.. Once again, I do Love your deposit and withdraw process which is SUPER.. I wish that your backbone office will do their best to make sure that the execution of the order could also deliver for bigger trading value.. Once they do, Please do inform me so that I could start trading with AYREX again and I will be your happy client as well..
Sure halamsja, I will let you know once the Ayrex provides CAD currency account so I will deposit and trade with them in that time. I do not plan to use U.S dollar account. We receive information from the processing company directly. Have you tried to deposit with a virtual card maybe? Because we do not accept such cards at the moment. the answer from Ayrex was card is not designed for online payments whereas Neteller answer was that Ayrex requires 3D secure verification which neteller card doesn't support! The strange thing that there are many clients paid via Neteller card according to Ayrex support!! Please, notice that 3D secure code is a part of requirements stated by the processing company. It allows you to get an extra protection for your transactions. If you are trying to deposit with a Neteller card, please, choose cards option in the "Deposit" section of your Personal account (not Neteller). Neteller is one of our the most popular deposit methods, as it allows to get automatic withdrawals afterwards. as I said why there are clients could pay with Neteller card whereas it doesn't support 3D secure?! !How come?!! Please, notice that verification deposit has to be made with a physical credit or debit card. Is your card one of these or is it a virtual one? Traders can deposit with Neteller account or with Neteller card, but there can be restrictions on Neteller's side for some countries. Could you provide us with information about where are you from or email address in private messages, so we could check your account specifically, please? I am amazed at you, you make 2000 a week and still work and have time to post this on binary forum, that is interesting, so why you are here then??? isn't 2000/week not enough for you? still want to make more? why don't you then trade yourself and leave us alone here...moderator, please ban this guy, thanks. Agreed with Arming.. What in the Hell you are doing if you are so success making money from Binary options Bizz.. So sick of this kind of people who brags about how great they are, only to lure newbies down to put the money to them in exchange of promise that they will make you RICH as BILL GATES.. Later on, all this newbies end up loosing the hard working money to these scumbags.. Please PRO.. If you are so great on making money, GREAT, and If you do want to help people to earn as much money as you did, Why don't you just share your LIVE account financial statement in one of Famous Binary Option Brokers.. Perhaps with AYREX.COM.. As a proof that you are doing so well and believe me when you do, there will be people who will contact you about Profit sharing by then.. YET, If you don't dare to do that, why don't you crawl back to the pit.. I banned Pro, FYI, that was some serious spamming. Thank you, we need to get rid of these spammers somehow. If you are looking for a way to check your trading skills against the other traders and won't mind profiting on it, you can check out our free Demo Binary Blast Contest tomorrow at 12:00 pm GMT. Become one of the 8 best traders and prove that you are ready for real trading and real winnings! You don't need to make any deposits or verify your account to be able to participate in it. If you have been waiting for a chance to win by trading binary options, this is it, don't miss it! Join the Contest now and become a part of the glorious competition between binary options traders! Ayrex,I dont have a utility bill in my name, I live with other people that pay the bills. So what can I do if I want to join? i asked a question, where did it go? For verification we require to check your Identity and Residential Address Proofs. Full list of requirements towards each document you will find in the "Documents" section of your Personal Account on Ayrex. how to send documents via computer? Basically, photo of any document with your name and address on it, stated within the last 6 months. Please, upload a photo of one of the documents from the list above in your Personal Account, "Documents" section as your "Address proof" and we will check during 1-3 hours 24/5. In case of any problems or questions, you can always contact us in Live Chat and we will help you as best as we can! Ayrex, any news for CAD currency accounts? I would like to trade with you guys but if this takes time then I might go somewhere else..thanks. Appreciate to any feedback provided..
We have took it into consideration, but unfortunately it won't be available anytime soon, as we had to withdraw card deposits in Canada. As soon as this policy changes, we will take it in work and inform our clients about it via the official resources. Please, log out, clear cache and cookies in your browser settings and try opening a position up to $3000 (maximum investment amount) during the day. In case of any problems, please, take a screenshot and send it to [email protected] and we will investigate your problem during 3 business days and come up with the solution. I have to get more specified answer from you since I trade during that time and I have problems with placing position to AYREX especially the amount of position which I could only place order at MAX US$300 (NOT even near to your specified Max of US$3,000).. Please refer to my chat with your staff on previous links in this forum.. Anyway.. I attach again the pictures for your reference.. Meanwhile, I did enjoy your DEMO account which I took on Jan 30, 2017.. I could place order during Japan and also when London market just open with any value, certainly more than US$300.. I DO WISH THAT THE SAME THING COULD BE DONE ON LIVE ACCOUNT, yet so far it is not happening.. Please note that my strategy is involving the MARTIANGLE so I need the ability to get into the amount up to US$3,000 MAX per position.. So your feedback and soonest solution is highly appreciated and I really wish to receive email from AYREX support informing me that your LIVE platform performs the same with DEMO platform at at whenever, wherever and whatever value I want to execute.. Please, Please, Please.. The maximum investment amount on the platform still remains $3000, like we have discussed earlier in this thread. It is exactly the same on the Real Platform and on the Demo and it's a fact. Due to the recently introduced system there can be certain limitations especially during the Asian session, but that depends on the automatically calculated number of options available for trading at the moment. Very often we hear that binary options trading is as easy as a piece of pie, but is it really? Is it the same as on demo, where you trade with the digital funds, not the real ones? 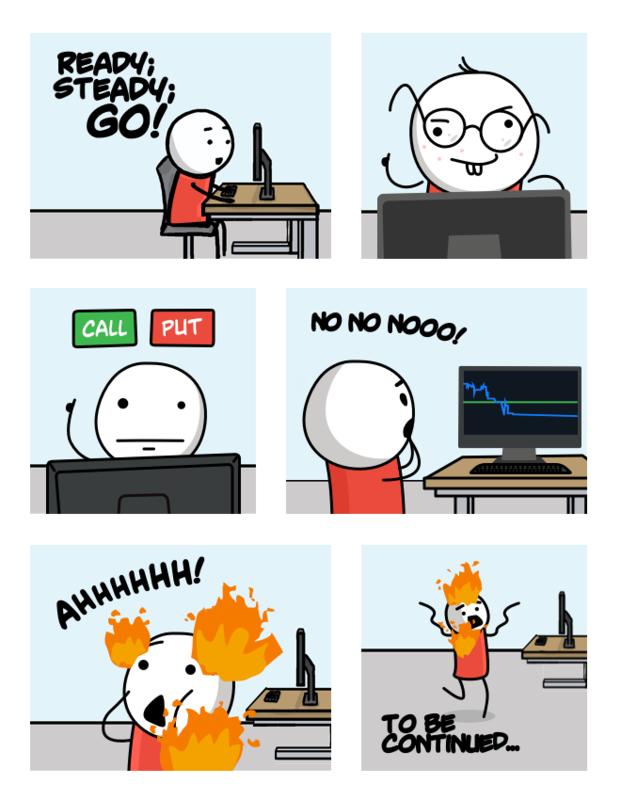 All of the sudden pressure becomes too heavy and we feel more like fragile humans than trading pros. If you want to become really good in trading, you need to learn how to control your emotions, because it can give you a lot of trouble, if market don’t go as you think it will. There are around 10 stages of becoming a real trader, which can be slightly different depending on your personality and trading experience. When you decide to enter the market, your decision is based on belief that this moment is perfect for trading. You feel almost certain that you know what will happen and it feels great. It is an “optimism” stage. Everything seems to be going smoothly and we are anticipating success, excited to see a positive outcome. At that particular moment, we are starting to feel kind of smart, like a real trading expert and our critical judgement becomes overclouded. It’s hard to analyze the current situation clearly in this “smart” stage, however, it’s crucial to stay conscious to be able to stick to your risk management strategy and do not rush into unplanned trades. When there first signs of the trade not going your way appear, we become nervous and worried. This is a start of “anxiety” stage, where we are starting to acknowledge that you can lose your investment and possible winnings and not really in control anymore. The absence of control bring the “fear” stage in. Realisation that we’ve made a mistake starting to grow fast. Facing a failure we often get our expectations down and make a resolution never to do to it again. “Giving up” stage helps us to cope with our current negative emotions and disappointment. No one likes to lose and if this happens we tend to fell into “depression” stage, playing all the things that went wrong over and over again. It’s the best to avoid this part or make it as short as possible, spending some quality time with your thoughts and making real plans how not to make same mistakes in the future. After that is done we realize that mistakes are actually the best education we can get and it can make a better trader out of us someday. “Hope” is “perpetuum mobile” for every trader, because even professionals can mess it up sometimes. Be ready that you will make mistakes eventually, but learn your lesson and make it for the benefit of you. Fully recovered we are ready to start trading again, entering the market with the priceless experience, which will help us further on. Market is going your way and “relief” makes you a smart trader again. It is very easy to give in to this impression that you are invincible, but stay concious and keep analyzing what is going on. This brings up back to "optimism" stage, because not only market moves in circles, but with the help of your experience and admiting that you are only human after all, it is easy to control your trading and emotions. Start analyzing not only the market, but the way how you feel about it and step a little closer to becoming a super trader! So as a conclusion.. "Due to the recently introduced system there can be certain limitations especially during the Asian session" This will be your REAL answer..WHY NOT IMPROVE THE INTRODUCED SYSTEM OR EVEN NOT CHANGING THE OLD SYSTEM????? If the previous system could make the performance the same between DEMO and LIVE platforms, then WHY the new system put the limit into the LIVE platform???? I am sure many ASIAN customers are agreed with me that we should be able to place position at any value during Japan market and the opening of London market hours.. But anyway.. I do respect your company's policy and wish AYREX for the best.. Yet, please consider my feedback.. REALLY, if the old system gives flexibility to users on placing orders at whenever, wherever and whatever value I want to execute, then WHY the new system puts constraint and limit the users position.. Yes, you have answered that on your previous links as well, and still it just does not make sense to me.. The current system is a part of company's risk management system, which allows us to make sure that we are always able to provide our traders with the legitimate earnings. It operates through out the day, constantly, but as during the assian session the number of traders increases massively, the number of available for trading options decreases accordingly. Please, notice that our platform is considerably young and we still keep working on it. Therefore, new features and systems are being implemented step by step and with a careful research. Once again, your current sentence is contradicted with your previous.. "But as during the Asian session the number of traders increases massively, the number of available for trading options decreases accordingly."... Whereas previously you quoted on January 24 "all your trades have been opened during Asian session at night, which is widely known for its low volatility and liquidity." How come during ASIAN session the number of traders jump into the market whereas EUROPE and USA are at NIGHT OR VERY EARLY IN THE MORNING???? So I think you just do not have clue on what is going on with the new system implemented.. Yet, It makes sense when you said "our platform is considerably young and we still keep working on it".. 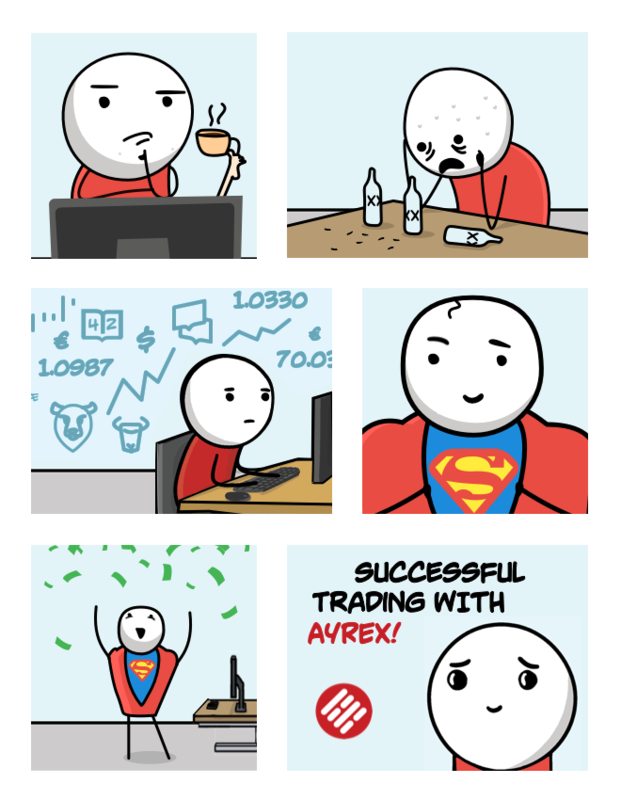 I wish AYREX could improve and put it back like the old system that allows the flexibility to place position during ASIAN market and the opening of London market hours.. That is the the ONLY thing that makes me AYREX HAPPIEST CLIENT..